Spirit keeps telling me to take Lavender, these past few days, bringing it into my life and to my attention in various sneaky ways. First it arrived via my current obsession with edible flower petals, and I found myself prickling it over my food. Now It’s the card I keep pulling from my home-made herbal deck. I have Lavender tincture preserved in pears, which is lovely and soft compared to the alcohol version. I can’t say this is an issue for me at the moment but it is for many people I am energetically supporting. I love herbs that calm anxiety while also treating depression, because the two so often go hand in hand. 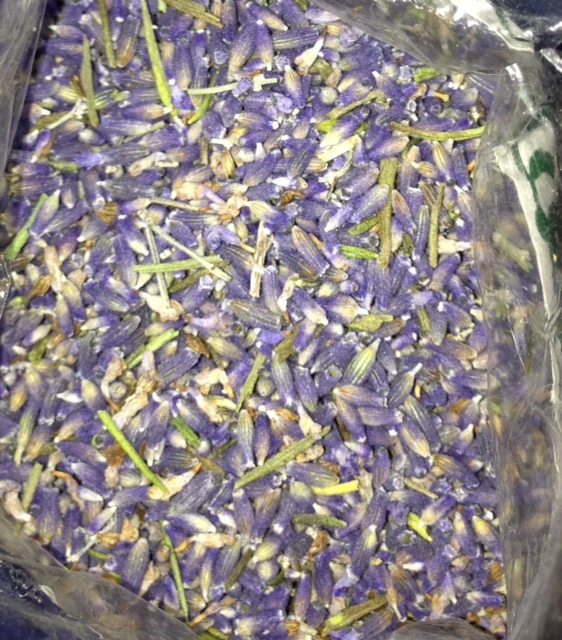 Lavender treats dizziness and insomnia, and stops us from from getting caught up in obsessive thoughts. I’m writing about anger at the moment in unit 4 of the distant aura healing and counselling course. When I initially began working with the aura, I didn’t associate anger with yellow, the colour of the solar plexus, but I’ve certainly learned over time that this can be a classic storage site for resentment. I gave someone a very low dose of nettles once and they broke out in a rash over the solar plexus area, while also suddenly finding it in their heart to forgive someone (i.e. release resentment). While Nettles is brilliant for resentment, anger that festers inside, Lavender is absolutely perfect for anger that is more openly expressed. If I have a client who is grumpy, tense and irritable, Lavender is often the helper I turn to. This is where nervous system and heart chakra meet, with strong emotions (conscious or not), affect the functioning of the heart. Palpitations are where the heart seems to beat louder than usual and the rhythm goes a bit wonky. Tachycardia is where the beat becomes too fast. I’m sure you can see the link here between the heart and anxiety. Hypertension is high blood pressure, which often has a stress-based cause. Lavender also has a calming affect on our digestive system, soothing away the nausea that can so often come when we are wired emotionally. It was only after being in a life-threatening situation for over 24 hours that I finally grasped just how sick too much adrenaline can make you feel! Whether it’s hanging off the side of a mountain, drinking too much coffee or being in a permanent war with your spouse or child, too much adrenaline really messes with appetite and stomach function. Lavender also works deeper down in the digestive system. It clears energy stagnation in the liver and gallbladder (i.e. solar plexus chakra). Symptoms of stagnation in this part of the body include pain and swelling in the right side of the mid-drift, nausea, constipation, irritability, headaches and vomiting. Lavender can resolve abdominal distension (bloating) and pain/colic, loose stool, and flatulence, especially when these symptoms are made worse by strong emotions. Lavender can help with sore throats, fever, painful congested sinuses, cough, asthma, and wheezing. I think this might be why Spirit is prescribing Lavender for me at the moment, at least on a physical level. Lavender helps with lower back pain, muscle aches and pains in general, and joint pain. Lavender reduces infections and inflammation, intestinal and skin parasites, promotes tissues repair and stimulates immunity. Scanty menstruation with cramps, infertility, painful labour. “How does this help?”, I asked. “As opposed to? It always helps me understand better if I can know what the absence of this state looks like.”, I asked. “It sounds a bit like Watchfulness Blue”, I remarked. Watchful Blue enhances our capacity for mindfulness, so we can be fully aware of what is happening within and around us. This colour enables us to stay completely present while also observing our experience from a detached perspective. You could imagine this being like a television screen with two camera angles being shown simultaneously; the first is a close up, the second is broad angle shot from a distance. This brings us into the immediacy of the moment without losing sight of the bigger picture. People wearing Watchful Blue always look for win-win situations and will stand back to observe their interactions with other people in order to make sure everything is fair and above-board. They pay full attention to what is being said by each person, including themselves. By observing the tone and body language of each person present, they can monitor the conversation and make sure everyone is being heard. They are good at identifying genuine core needs and making sure these needs are being met fairly without hidden agendas or manipulation. Blue auras generally have a yin or feminine approach to problems. Rather than go into battle in overt ways like people with Red auras do, they use subtlety and strategy to win the battle. Where Red auras have a need to conquer, healthy Blue auras are more interested in negotiation. People who wear Watchful Blue try to find a way for both parties to walk away happy whenever possible. Blue auras can be a bit sneaky sometimes because they operate in more hidden ways, but Watchful Blue always has a good standard of integrity. An equivalent to the word negotiate, is navigate. Watchful Blue types love the art of strategy and will think ahead to consider the best strategies available to them. This colour helps us look ahead to assess the lay of the land and consider the obstacles coming up. This is easiest to do when we rise up and imagine looking down over our lives from above, as though looking over a map or a landscape. For this reason, I often associate Watchful Blue with metaphorical images suggestive of a birds-eye-view, such as large birds of flight soaring high, or spirit rising up out of the Crown Chakra via a silver cord which keeps it connected to the body. My favourite metaphorical Watchful Blue image combines these two ideas together. In this image, I see a woman in a canoe navigating through a wild river. She has a companion hawk flying above her, being her eyes, and calling to warn of impending collision. She is mindfully in the moment as she skilfully weaves her way through the rocks. In a way, the hawk and her spirit have combined together as one, effectively giving her two sets of eyes- one above, one below. As a mindfulness colour, Watchful Blue can also represent meditation. When we meditate, we are watching our own mind, body and feelings without getting caught up in it all. This capacity to stand back and observe helps us develop self-awareness and mental discipline. When we are completely aware of thoughts, feelings and body sensations as they arise, we can assess their merit and make better decisions about how to respond to them, if at all. Thoughts, feelings and sensations are like waves – they come and they go. And so long as we do not latch onto them with our minds, we can stay relatively centered. By comparison, an undisciplined mind tends to be be driven by stray thoughts, feelings and sensation as they arise, without any self-awareness. A thought arises and the undisciplined mind latches onto it and rides it like a surfer on a wave. But not all waves are good waves to catch! Some emotions and thoughts take us in unhelpful directions. Bad waves can wash us out to sea emotionally, or batter us up against hard rocks psychologically. The disciplined mind of a Watchful Blue person can tell the difference between a good wave and a bad one because they can see where the wave will take them. I love using this colour during healing work, when I take clients on guided meditation journeys to help them see themselves, their relationships and their life from a broader, detached perspective. I really enjoyed today and found it interesting. Especially the exploring healing through being mindful of my body. I really liked the way you had people caring for themselves through caring for others. It was also comforting that you were keeping an eye on what we were doing while healing others. Like when you said to me don’t go into them so much. I was inspired at how you can do group work in that space. I am thinking how I could do that in my consulting room. Will send ebook stuff later. Hi Damien, thank you so much for the feedback. It’s really helpful! I’m glad you enjoyed it so much. I really love teaching and it was great to finally have you there with us. Yes, it’s not a big space, but we somehow pull it off, and in doing so, perhaps we are challenging ourselves even more regarding boundaries, and build better boundary-muscle in the process.